I've lived or worked in great metropolises like London, Mumbai, Toronto, New York and Los Angeles. I'm a big city lad born and bred. But when I first took a drive in a convertible Mustang up through California's Central Coast, my eyes opened wide to sights previously unseen. 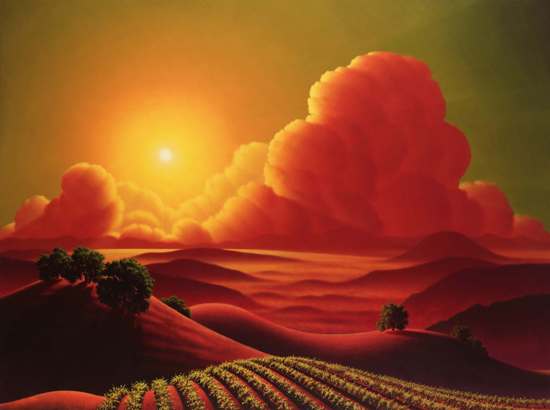 Under soaring skies were great expanses of fields -- some empty except for a solitary tree, others lushly rowed in grape vines -- surrounded by layers of rolling hills with puffs of clouds billowing from behind them. Most of all, even as the muscle car in my hands rumbled, there was an overall sense of pervasive calm and an immediate connection to Nature. As internationally known art and wine expert and local bon vivant Archie McLaren puts it, "Unlike L.A. to the south and San Francisco to the north, there's generally no freneticism here." The feeling evoked is similar to that in a favorite Twilight Zone episode, "A Stop at Willoughby." An overstressed New York ad man -- think Mad Men's Don Draper at his wit's end -- is told about Willoughby, a peaceful place, "where a man can slow down to a walk and live his life full measure." 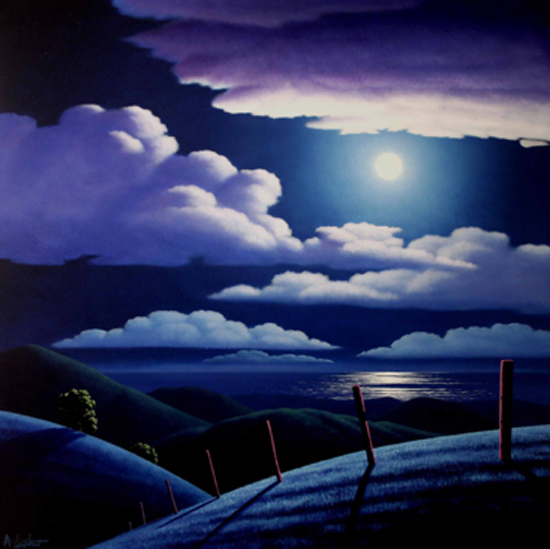 Artist/author Adam Licsko, whose "Crescent Moon" painting will be auctioned off as part of the Rare & Fine Wine & Lifestyle Auction at the 29th Annual Central Coast Wine Classic (July 11 - 14), was also drawn to the area. Living for over ten years in Cambria, Paso Robles and San Luis Obispo, Licsko drew inspiration for his brilliantly vivid and evocative landscape paintings from the central coast's diverse topography. "I hiked up in the forests and semi deserts, and drove through those vast expanses of land. I soaked it all in, the vastness and solitude, the textures of the hills under the big skies. I don't use photographs for my paintings. I prefer to immerse myself and create memories of what I experience. There's a quiet intimacy to the land, and I've always felt something emotional. And I use colors to bring that quiet intimacy, those memories and feelings to my paintings." His colors are often contrary to what photographs show. Skies become verdant greens, rare reds and even majestic purples. His land shimmers in searing blues and fiery yellow. Presently exhibiting at Cambria's Vault and Ojai's Primavera galleries, Licsko enthuses, "I hope my landscapes help people reconnect with Nature." It seems natural to combine wine and art as we do at the Wine Classic event as there's a nexus between people who enjoy inspiring art, and those who enjoy fine sunsets, conversations, fine food and vintage wine. The CCWC, based in and around Avila Beach, is a four-day comprehensive food and wine event featuring winery dinners and a grand dinner at Hearst Castle, symposiums, and reserve tastings. The auction offers rare wines and lifestyle packages, and includes art works from exceptional artists like Licsko and his celebrated mother Joanne Licsko. Genial McLaren, who's a member of influential vintners' clubs and food/wine societies, says, "The Wine Classic not only promotes the wine, culinary and hospitality industries here, but the auction's proceeds support a growing number of healing, performing and studio arts organizations on the Central Coast. Over the past nine years the event has given grants over $2 million to over 100 non-profits." The event feels like it has heart but Archie is another reason. He's very passionate, and he understands the creative process. Artists and winemakers are connected. They're both passionate and creative. Vintners cleverly use materials, and there's a science to their art. Similarly, artists understand perspective and once you know the rules of light and space, you can creatively bend them. McLaren adds, "Adam channels a magical component in his art that manifests itself in a physical and spiritual aura that is unmistakably his own. We, Carissa and I, have his 'Deep Blue' painting at our Big Sur home that appears like you're looking from a ranch, toward the ocean at Big Sur, on a moonlight night -- capturing that very essence."